ANDREW ROY was born in Lanarkshire, Scotland, in 1834. He attended school until he was eight years of age and then went to work in the coal mines. When he was sixteen his father and family moved to America and settled in the coal regions of Maryland. Young remained with his parents a few years and then went west, working in the mines of a num­ber of Western States. In 1860, together with a friend, he was digging coal in Arkansas. The booming of the rebel cannon before Fort Sumter shook the woods of that half-savage State. Roy saw the gathering clouds of civil war and did not hesitate a moment. He threw down his tools, hastened east and joined a Pennsylvania company of volunteers. He under McClellan in the bloody battles before Richmond, was shot through the body at Gaines' Hill and was left as dead by the retreat­ing Federals. The rebels, however, found him yet alive and sent him back to Libby Prison. In a few months he was paroled, returned home, had a surgical operation performed on his wound and recovered. He married Janet Watson in 1864, and a few years later moved to Ohio. After the dreadful Avondale disaster ­Mr. Roy was sent by the miners to Columbus to urge upon the legislature the necessity of mining laws for Ohio. Governor Hayes ap­pointed him to serve with two others on a com­mission to investigate the condition of' the ANDREW ROY, mines and report the same to the legislature. The result of the report was the passage of mining laws. Governor Allen appointed Roy mine inspecting for four years, and Governor Foster did the same. In 1884 Mr. Roy retired from the office, enjoying the respect of the miners of the State. During the time he held the inspector's office he gained a considerable reputation as a geologist. His efforts on behalf of the miners were unceasing, and he has been called the father of mining laws in Ohio. He is the author of several books on coal-mining and frequently contributes articles to the noted mining journals of the country. At present (1888) he resides at Glen Roy, a mining village in Jackson county, Ohio. THE Ohio coal-field is part of the great Appalachian coal-belt which extends from Pennsylvania to Georgia and which runs through portions of nine different; States, namely: Pennsylvania, Maryland, West Virginia, Virginia, Kentucky, Ohio, Tennessee, Alabama and Georgia. The State of Ohio contains about 12,000 square miles of coal-producing strata, the line of outcrop extending through the counties of Trumbull, Geauga, Portage, Summit, Medina, Wayne, Holmes, Coshocton, Licking, Perry, Hocking, Vinton, Jackson, and Scioto. Outliers of coal strata are found in several counties west and north of this line, but they contain little coal of any value. The coal measures of the State, as well as all the rocks of the geological scale, dip to the east at an average rate of twenty feet to the mile. Hence the eastern margin of the coal strata in the high land bordering the Ohio river in the counties of Belmont, Monroe, Washington and Meigs, attains a thickness of 1,400 to 1,600 feet. These strata are separated into three divisions by our geologists and are known as the "lower measures," the "barren measures," and the "upper measures." The lower measures are about 550 feet thick, the barren measures 450 to 600 feet thick, and the upper measures about 600 feet thick. in some portions of the coal-field, rise to minable height, and also many thin veins of no immediate commercial value. Besides the workable beds of coal there are numerous seams of iron ore, fire-clay, limestone, building stone of great extent and value. In the barren measures there are no seams of coal of minable height that are worked, and but one seam that may be regarded as a workable vein. The upper measures hold nine different beds which rise to three feet and upward, the thickest, most extensive, and by far the most valuable of the series being the lower bed of the series known as the Pittsburg vein. In the lower measures the lowest coal, known as No. l in Dr. Newberry's nomenclature, is extensively mined in the counties of Jackson, Stark, Summit Mahoning and Trumbull. In the two last-named counties this coal is now well nigh exhausted. It is known in market as the Briar-Hill coal, and enjoys a wide reputation as one of the best dry-burning or furnace coals in the United States. The vein, as mined, ranges from two to five feet in thickness, and is met in troughs or basins which are separated from each other by extensive intervals of barren ground. Hence, while the greater portions of the townships of Brookfield, Vienna, Liberty and Hubbard, in Trumbull county, and nearly all of the town­ ships of Mahoning county, in the Mahoning valley, are underlaid with coal­ bearing strata, not one acre m fifty holds the coal where it is due. Similar con­ditions exist in Stark and other counties in the Tuscarawas valley as well as in Jackson county. The swamps or basins in which this coal reposes are long, narrow and serpen­tine, and seem to have been formed by erosive agencies before the coal flora grew. The rocks underlying the coal are spread out in level sheets with the normal dip to the east, while the coal itself pitches and waves sometimes at an angle of twenty-five degrees. It grows gradually thinner as it rises out of the swamp until, on the edge of the basin, it disappears as a feather-edge. The other beds of the lower measures which are in most active development are the Wellston coal of Jackson county and the Nelsonville or great-vein coal of the Hocking valley. The Wellston coal lies about 100 feet above the lower, or coal No. 1, and is a seam of great purity and value. It is three to four feet thick, a homogeneous mass, of an open burning character, and is used for smelting iron in a raw state in the blast furnaces of Jackson county. The greater portion of the output of the mines, however, is shipped west and north to the vast coalless regions, and is used for household purposes and for generating steam. The Nelsonville or great-vein coal is more extensively mined than any seam of the series. It is the thickest coal in the State, rising at many places in the Hocking valley to ten feet or more, and in the great majority of the mines of the Hocking region the coal is never less than five and a half feet thick. The bed is met in three divisions, known as the lower bench, the middle bench, and the upper bench, these benches being separated by two bands of shale. The lower bench is about twenty-two inches thick, the middle bench about two feet thick; and the upper bench from two feet to six feet, according to the height of vein. Where the seam rises to nine, ten and eleven feet, the unusual height is due to the union of two seams, a rider of the main seam, two' to three feet thick, coming down upon the main seam. There are a dozen districts in the State in which coal is extensively worked from some one or other of the lower beds of the State series. These are the Mahoning valley region, the Tuscarawas valley region, the Salineville region, the Coshocton region? the Dell Roy or Sherrodsville region, the Cambridge region, the Jackson region, the Ironton region, the Nelsonville or Hocking valley region, the Steu­benville region, the Zanesville region, and the Dennison region. the vein is level free it is won by drift mining; but where it lies under cover at all points it is reached by shafts or slopes. Slopes are not suited to mine coal at depths exceeding 100 feet, and shaft mining is the favorite method. None of the shaft mines of the State exceed 300 feet of perpendicular depth, and the majority of shaft mines are less than 125 feet deep. An opinion prevails among mining geologists that the lower coals, which are due on the Ohio river at Bellaire and Pomeroy 1,000 feet below the surface, do not exist there, and such practical facts as we have on hand-the result of boring for salt, oil, and gas ­seem to encourage that view. There are extensive wastes or areas of barren ground in all the regions of the State, and it is never safe to count with absolute certainty on the presence of a seam of coal at any point of the coal-field until it has been found by prospecting on the hillside or struck by the driller's chisel in boring. These barren areas are due to a number of causes, such as water-spaces in the old coal-marsh, water-currents flowing over the coal vegetation while the peat bogs of the carboniferous age were undergoing decomposition, and mineralization, etc., etc. The seams are also liable to thicken up and to dwarf down to a mere trace, when followed from one county to another. There are several varieties of coal in the Ohio coal-field, such as open-burning, or furnace coal, cementing or coking coal, and cannel coal. The first of these varieties is often used as it comes from the mine for smelting iron; while the cementing variety has to be converted into coke before it is fitted for the manu­facture of iron, for it melts and runs together in the act of combustion, forming a hollow fire, and hanging in the furnace. Cannel coal is smooth and lard, and breaks with a conchoidal fracture. This variety contains more gas than the ordinary free-burning and coking kinds. It burns with a bright flame, and the gas manufactured from it possesses high illuminating power. Cannel frequently changes to the ordinary bituminous variety, and vice versa. "PENINSULA, Summit County, Ohio, April 8, 1878. Sir: Not long since I saw in the papers that in your annual report as State Inspector of Mines you stated that the first coal shi Hall's, to Cleveland was in the year 1828, and by the late Mr. Henry Newberry, of Cuyahoga Falls, father of Prof. Newberry, of Cleveland. I took that coal to Cleveland for Mr. Newberry, it being fifty years ago since it was done. I was then in the seventeenth year of my age, and have resided in this place ever since 1824. There were three of us buys on the boat. One of them was about a year my junior, and now resides in one of the townships of Cuyahoga county, and became a successful inventor and businessman. The other was then in his twelfth year, and is now a lawyer, with a lucrative practice, in a beautiful growing city in an adjoining State. On the first of' January last 1 made a New Year's call on Prof. Newberry at his home in Cleveland. A few years ago I presented Prof. Newberry with a lump of the coal taken from one of the boat-loads of' that coal. As this whole transaction is somewhat remarkable, I have taken the liberty to write you about it, especially as we three boatmen are natives of Cuyahoga county. 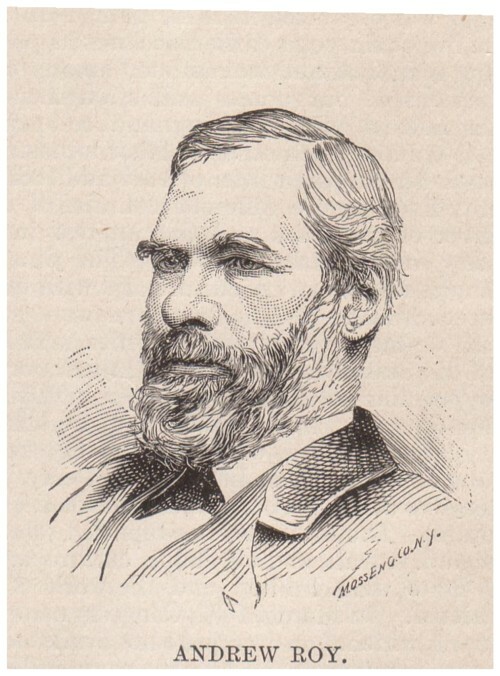 The late President Garfield was a canal boatman from the mines of Governor David Tod, of Briar Hill, Youngstown, to Cleveland, when he was a boy of fifteen years of age; and an accident which occurred to Garfield while on a canal-boat, by which he was nearly drowned, determined in some degree he believed, by providential interface. He resolved to become a scholar, believing that God had destined him some great purpose in life. The mines of Mahoning valley region were first opened by Governor David Tod, in the years 1845, at Briar Hill, and such was the superior quality of the coal that the coal of the Mahoning and Shenango valley was ever after known. in market as Briar Hill coal. At Mineral Ridge, a few miles from Briar Hill, the coal-seam is split in two, the intercalated material consisting of a seam of black band iron ore, from four to fourteen inches in thickness. This ore is mined in connection with the coal, and is used in the blast-furnaces of the region with the hematite ores of the Lake Superior region, producing a very superior grade of iron, known in market as American Scotch pig. The seams of coal and iron ore of the Hocking valley region were noted by the first white men who visited this country. A map of the Western country now in the possession of Judge P. H. Ewing, of Lancaster, Fairfield county, published in the year 1788, notes a number of sections of coal and iron-ore beds. The development of the great coal region of the Hocking valley was due to the construction of the Hocking valley branch of the Ohio canal. Among the pioneer mine operators of this region was the elder Thomas Ewing, afterwards United States Senator from Ohio, and a member of President Lincoln's cabinet. His mines were located at Chauncy, at Nelsonville. The best market for coal at that time was the old Neil House, in Columbus. Thomas Ewing, and his asso­ciates in business, Samuel F. Vinton, Nicholas Biddle, and Elihu Chauncy, also mined salt in the Hocking valley, the first salt-well of the region being sunk in the year 1831 by Resolved Fuller, the water yielding ten per cent. of salt. The Ohio and Mississippi rivers are the greatest and cheapest coal carriers in the world, and the vast coal-trade development of these famous streams dates back fifty years. The cost of shipping coal from Pittsburg to Louisville is only one and three-quarter cents per bushel, or forty-three and three-quarter cents per ton, the distance being upward of 600 miles. From Louisville to New Orleans, a distance of 1,400 miles, the freight on coal is two cents per bushel, or fifty cents per ton, and this includes the return of the empty barges. The lowest freights charged by railroads is one cent per mile. In the year 1818 a merchant of Cincinnati made an estimate for the benefit of Samuel Wyllis Pomeroy, who owned the coal-lands on which the mines of Pomeroy are now opened, of the amount of coal then used on the Ohio river between Pomeroy and the falls of the Ohio. One of the noted pioneer miners of the Ohio river is Jacob Heatherington of Bellaire. Mr. Heatherington is a practical miner of English birth who came to Belleaire more than half a century ago. He purchased a mule which was named Jack, and leased three acres of coal-land fronting the Ohio river. Jack did ser­vice as a mining mule for thirty years, during which time Mr. Heatherington prospered in business. When the faithful mule was no longer able to work his master turned him out to pasture and with great solicitude watched over his declining years. When poor Jack fell and was too old and infirm to rise he was gently raised to his feet by loving hands, and when death came at last the faith­ful animal was buried with great ceremonies. Mr. Heatherington lives in a fine mansion on the Ohio river, and upon the keystone of the arch over the hall door has been carved the head of the faithful mule. coal is at all points in this region below water level and is found in basins or pots of limited area it has to be located by boring. Mr. Andrews was unsuccessful for several years, spending many thousand dollars and bringing himself to the verge of financial ruin. But he continued prospecting until success rewarded his persevering efforts, and he is now one of the greatest coal miners in the State, being owner besides of blast furnaces, rolling-mills and railroads which he has built by his determined perseverance and business successes. The extraordinary prosperity of Youngstown is due to Chauncey Andrews more than to all other causes combined. The space allotted to this article is too brief to include a sketch of the develop­ment of the coal trade, and of the men who were the pioneer miners of the State. Such a sketch, however, could not fail to be of great interest to the people of Ohio, for coal is the power upon which the future wealth and prosperity of the Ohio, will largely depend. The manner of mining is the same in every mining district. Where the coal is level free it is followed into the hill sides, and the workings are opened up by driving galleries eight feet wide on the face slips of the coal, which run in a northerly direction. At intervals of 150 to 200 yards branch galleries are opened of the same width as the main ones, and the rooms or chambers from which the coal is chiefly mined are opened out from the side or branch entries. The rooms are driven forward eight to ten yards wide or eighty to one hundred yards, pillars or columns of coal being left between the rooms for the support of the superincumbent strata. Where the coal is won by shaft mining the same system of working out the coal obtains as where the seam is level free, but larger columns of coal are left to keep in place the overlying rocks in deep shafts than in shallow ones or in drifts or level free openings. Some seams of coal are more tender than others and larger pillars are required in consequence. Such seams of soft coal are less able to resist the overlying pressure than those of a firm and compact character. As a general rule mining operators aim to take out about 66 per cent. of coal in working forward, and after the workings have been advanced to the boundary of the plant the pillar coal is attacked in the far end of the excavation, and as much of the pillar coal mined as can be recovered. When an area of several acres has been all worked away the roof falls to the floor, and while the rocks are breaking the whole of the overlying strata appears to be giving way, but the miners con­tinue at their posts until the crash finally, occurs, when they retreat undismayed under the protection of the unmined pillars. The pillars bordering the last fall are next attacked and worked out until another crash comes on, and this method is repeated until the workmen reach the bottom of the shaft or the mouth of the drift. If the seam of coal is five or six feet thick and the overlying strata not more than 150 to 200 feet, great chasms are frequently made on the surface of the earth directly over the places where the coal has been mined out. Houses and parts of villages are sometimes involved in the subsidence. A system of working coal prevails in some of the mining regions of Illinois and Kansas, of working all the coal out as the miners advance with the excavations. This plan is known as the long wall system, and is only practiced in seams of four feet or less in thickness. Where bands of shale or fire clay are met in the coal and have to be sorted out and thrown aside in the mine, they are an advantage in long wall working, as they assist in the construction of the pack walls, which require to be built where the miners are at work. While long walk min­ing has many warm advocates among practical miners in Ohio this system has never obtained a permanent foothold in the State. Several of our coal seams are well adapted to long wall working. and the slack into still another, and thus assorted the various grades are shipped to market. The capacity or output of the mines of the State varies greatly. Thick coals are capable of a greater daily output than thin seams, and as a general rule drift mines possess greater advantages for loading coal rapidly than shaft openings. In many of the mines of the great vein region of the Hocking valley the capacity is equal to 1,200 to 1,500 tons per day. In shaft mines 600 to 700 tons daily is regarded as a good output. The first ton of coal in a shaft mine 100 feet in depth and having a daily capacity of 600 tons frequently costs the mining adventurer upwards of $20,000, and cases are on record where owing to the extraordinary amount of water in sinking, $100,000 have been expended before coal was reached. Drift mines, as they require no machinery for pumping water and raising coal, cost less than half the amount required in shaft mining. Water is, however, an expensive item in drift mines opened on the dip of the coal, and underground hauling under such conditions is unusually costly, par­ticularly if horses or mules are used. Many mining companies use machinery instead of horse-power, and this is always true economy. Two plans obtain where machinery is used, namely, by small mine locomotives and by wire ropes operated by a stationary engine located outside or at the bottom of the mine. Locomotives are objectionable owing to the smoke they make, though under the management of a skilled mining engineer who is master of the art of mine ventilation, the smoke from a mine locomotive can he made quite harmless. Three gases are met in coal mines which make ventilation a paramount consideration. These gases are known among miners as fire damp, black damp and white damp. Fire damp is the light carburetted hydrogen of chemistry, and when mixed with certain proportions of atmospheric air explodes with y, great force and violence, producing the most dreadful consequences. Black damp is carbonic acid, and white damp is carbonic oxide gas. They are formed by blasting, by the breathing of men and animals, and they escape from the coal and its associate strata. Fire damp is seldom met in alarming quantities in drift or shallow shaft mines, and as our mines in Ohio are all less than three hundred feet below the surface, few explosions of a very destructive nature have yet occurred in the State. Black damp is the chief annoyance in Ohio mines. There is an excitement in coal mining as there is in every branch of mining the useful and precious metals. Few men who go into the coal business ever turn their backs upon it afterwards. And, indeed, there are few failures in coal min­ing enterprises, while nearly every adventurer grows rich in time. Until the year 1874 there was no attempt made to collect the statistics of the coal production of the State. In that year the General Assembly created the office of State Inspector of Mines, and the inspector published in his annual re­ports from the best data obtainable a statement of the aggregate annual output, beginning with the year 1872. For several years after the enactment of the law creating the Department of Mines operators were unwilling to furnish the mine inspector with a statement of the output, and as the law did not require this to be done, the statistics were generally estimates based on the returns made to the mine inspector by such companies as chose to report the product of their mines. In 1884, however, the law was so amended as to require all the mining firms in the State to report the product of coal, iron ore and limestone, and the annual output of these minerals is now more accurate and valuable than formerly. TABLE OF TONNAGE, TIME WORKED, NUMBER OF MEN, ETC., IN EACH COUNTY IN 1887. The beds of iron-ore associated with the coal-seams of the Coal Measures are known by the general name of black-band ore, limestone ore, block ore, kidney ore, etc. Black-band is a dark gray, bituminous shale with reddish streaks run­ning through it. It is met in paying quantities in only two horizons in the State; namely, that of the lower coal of the series, as has been already stated, and over coal No. 7. In its best development in the mines of the Mahoning valley it yields a ton of ore to a ton of coal, but one ton of ore to three tons of coal will be the general average, and it is present in only a few mines of the valley. In the Tuscarawas valley, near Canal Dover and Port Washington, the black ­band capping coal No. 7 met in basins of limited area. In the centre of these basins the ore is sometimes met ten to twelve feet in thickness, but it soon dwarfs to a few inches and disappears entirely. Black-band has been met on other hori­zons of the lower Coal Measures, but never of such quality as to justify mining. The limestone ores, as calcareous and argillaceous carbonates and hydro-peroxides or linonites, are very abundant and have been mined for fifty years in the Hanging Rock regions of Ohio and Kentucky. They were the base of the charcoal iron industries of this famous iron region-an industry which, owing to the growing scarcity of timber, is fast disappearing forever. The limestone ores derive their name from being associated with a thick and extensive deposit of gray limestone which is spread over a greater portion of the counties of Lawrence, Scioto, Jackson and Vinton, in Ohio, and the counties of Greenup, Boyd and Carter, in Kentucky. The iron made from this ore has always held a front rank in market, the cold-blast iron being particularly prized for the manufacture of ordnance, car wheels and other castings requiring tough iron. parison with the gray limestone ore both as regards quality of mineral and thickness of vein. The ores of value in the horizons of the Hanging Rock region are known as the big red block, the sand block and the little red block. These deposits lie lower in the geological scale than the limestone ore, and are obtained by stripping. The big red block sometimes rises to eighteen inches in thickness, but it is generally met in beds of six inches or less. The sand block ore is also less than six inches thick, and is inferior to the big or little red blocks in quality, containing less iron and more silica. The little red block is not more than four inches thick on an average. These ores are mined in connection with the limestone ore wher­ever they are met in paying quality and quantity. They are too thin as a general rule to follow under cover. Occasionally other seams are met and mined, and a deposit known as the Boggs, which rises to three and four feet in thickness, but occurs as a local deposit, is recovered by drift mining. In most of the coal regions of the State iron ore is mined to a greater or less extent, the deposits of the Hanging Rock region reappearing as equivalent strata on the same geological horizons in every part of the coal-field. The ores have local names, as the coals have local names. Nowhere is exclusive reliance placed in the native ores of the State in the manufacture of stone coal iron, the Lake Superior and Iron Mountain ores of the specular and hematite varieties forming an important mixture at every blast-furnace, while in several of the iron producing districts foreign ores are used exclusively. We have no hematite ore in the Coal Measures of Ohio, although our linonites, which are simply argillaceous carbonates oxydized by the action of the atmosphere, bear some resemblance to hematite ore. Black band and clay band ores are the main product of the Coal Meas­ures. The following is the output of ore for the year 1887, as copied from the last annual report of the inspector of mining.